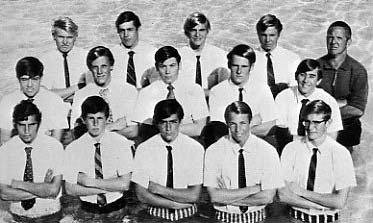 Won swimming letters in 1971, 1972, 1973 and 1974...member of four Big Ten and three NCAA championship teams... won seven individual Big Ten championships in backstroke events and eleven Big Ten titles total...won NCAA championships in the 100 and 200 meter backstrokes in 1973...member of the 1972 U.S. Olympic team, winning a gold medal in 400 meter medley relay and silver medals in 100 and 200 meter backstrokes...former world record holder in 100 meter backstroke. 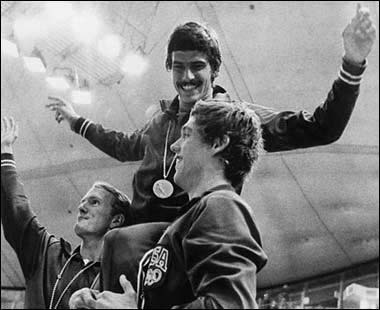 American swimmer Mark Spitz wins seven golds and breaks seven world records, perhaps the greatest Olympic performance of all time. Here, his teammates, Tom Bruce (left) and Mike Stamm (right) carry Spitz on their shoulders during the medal ceremony for their victory in the men's 4x100-meter medley relay  his seventh gold.